Dan Chaisson, Pete Burgio, and Mike Samko (triple), had two hits each to lead the Watertown Reds to a 10-4 win over the Wakefield Merchants at Bentley University on Monday night. Mac Jacobson and Ryan Pocock each had a double and two RBI and Will Brennan added a triple for the Reds. Jonathan Bishop (1-1) went five innings, struck out seven, and allowed just two hits, to get the win. Chris Hendrix and Matt Horan each tossed a scoreless inning of relief. Scott Searles and Mike Sorrentino both had a couple of hits for the Merchants. At Maplewood, the Chiefs overcame a 4-0 Melrose lead in the first inning and scored 14 times in the bottom of the sixth to take a 17-5 win. Rookie Anthony DeSouza (1-0) picked up his first ICL win, striking out five in just two innings. Jared Freni had 10 K’s in his five innings of no decision work. Catcher Jordan Pallazola had a big three hit night at the plate which included two doubles, four RBI’s, and his first ICL homer. Mike Burgoyne and Danny DiMare also had three hits each for the Chiefs. Veteran Mike Adessa had two hits for the Americans. Tony Annino (1-0) got the win and Chris Law chalked up the save when the Lexington Blue Sox held off a seventh inning rally to edge the Reading Bulldogs 4-3 at Endicott College in Beverly. Alex Voitik (pictured above) hit his second homer of the season for the Blue Sox. Hank Oringer and Johnny Hayes had two hits apiece for the Bulldogs. Max Mardany (0-1) took the loss. On Tuesday, the Somerville Royals host the Arlington Trojans at Trum Field at 8:15 PM. Mike Taylor and Darren Hartwell had three hits each to lead the Reading Bulldogs to 9-8 walkoff win over the Watertown Reds at Endicott College. Taylor had two doubles and two RBI’s and Hartwell also stole a couple of bases. Jack Burke (2-0) picked up the win with two innings of scoreless relief. Dan Chaisson and Pete Burgio hit home runs for the Reds. In other Sunday action, Eduardo Soto hit his first home run in a Blue Sox uniform to lead Lexington to a 3-1 win over the Merchants at Walsh Field. Ryan McCarthy had two hits and scored twice and Josh Hassel had a double and two RBI for the Sox. Aidan Freeburg pitched five innings of one-hit ball to improve to 2-0. Joe Westerman (1-1) took the loss despite striking out eight batters in seven innings. Scott Searles’ sacrifice fly drove in the lone Merchants run in the bottom of the seventh inning. Adam Johnson had a homer, double, and three RBI when the Somerville Royals beat the Melrose Americans 7-2 at Morelli Field. Sean McPhee and Wagner Gomez added two hits each to pace the Royals’ ten hit attack. Ryan Covelle (1-0) got the win with five K’s in his four innings of work. Kevin Kelley and Harrison Engstrom had the RBI’s for the Americans. Three ICL games are scheduled for Monday. The Merchants visit the Reds at Bentley University at 6:00 PM, the Blue Sox and Bulldogs tangle at Endicott College at 8:00 PM, and the Chiefs host the Americans at Maplewood (Malden Catholic) at 8:15 PM. Three players with Intercity League connections were selected in the recent Major League Baseball draft. Medford’s Paul Covelle was taken in the 27th Round by the Seattle Mariners. The right-hander pitched briefly for the Andre Chiefs in 2012. He graduated from Malden Cathoilc before going on to star at Franklin Pierce. He is currently on the roster of the Somerville Royals along with his brother Ryan. Lexington Blue Sox outfielder Jansiel Rivera of Methuen, MA was also selected by Seattle in the 22nd Round. Rivera was 2 for 5 and had an RBI in his first three ICL games for the Blue Sox this season. 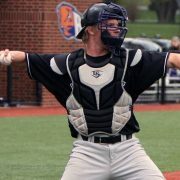 Catcher Ryan January of Swampscott MA, grandson of ICL umpire Don January and nephew of ICL umpire Jeff January, was picked by the Arizona Diamondbacks in the 8th Round. January played for San Jacinto JC in Texas this past Spring. Dan Cacciola, Kevin Kelley and Austin Masel had two hits each to lead the Melrose Americans to a 4-3 win over the Arlington Trojans at Summer Street Field. Bobby Tramondozzi tossed 2.1 innings of one-hit relief to pick up the win. Shawn Smeglin worked into the fifth for the Americans allowing only one earned run. Included in Masel’s two hits were a triple and two RBI’s. Tim Dunphy (1-0) went the distance for the Chiefs in a 5-3 comeback win over the Reading Bulldogs at Endicott College. Danny DiMare led the way at the plate for the Chiefs with a 2 for 4 night adding a triple and a couple of RBI’s. Ryan Sonberg and Peter Copa recorded doubles as the Chiefs rallied back from a 2-0 fifth inning deficit. Darren Hartwell, Hank Oringer and Zac Talis banged out two hits each for the Bulldogs. There are no ICL games scheduled on Saturday. On Sunday, the Somerville Royals meet the Americans at Morelli Field at 4:00 PM, the Wakefield Merchants host the Lexington Blue Sox at Walsh Field at 4:00 PM, and the Bulldogs and Watertown Reds get together at Endicott College at 7:00 PM. Bill Sullivan tossed a three-hit shutout to lead the Reds to a 5-0 win over the Wakefield Merchants on Thursday night at Victory Field. Sullivan struck out seven and walked only one as the Reds improved to 2-1 on the year while handing the Merchants their first loss. Justin Forman (RBI) had two hits, including a double, and Dan Chaisson added a couple of hits and an RBI to lead the Reds offense. Kyle McCarthy (0-1) took the loss. Mark Poli had two of the Merchants three hits. In Lexington, the Chiefs beat the Blue Sox 6-2 . Mike DiCato (1-0) went the distance for the win, scattering seven hits. He walked two and had two strikeouts. Pete Copa had a two run double and Billy Mottram and Nate Witkowski each had two hits for the Chiefs. Alex Voitik and Jansiel Rivera had the Blue Sox RBI’s. The win was the 600th of Manager Chuck Andre’s career. On Friday, the Melrose Americans meet the Trojans at Summer Street Field in Arlington at 7:00 PM and the Chiefs take on the Reading Bulldogs at Endicott College in Beverly at 8:00 PM. Steve Keskinidis tossed a neat four-hitter, striking out 11, when the Merchants turned back the Arlington Trojan 8-2 in Wakefield. Bobby Lossano (pictured above) and Louis Tarrantino both had perfect nights at the plate going a combined 7 for 7 and each stealing a base for Wakefield, who won their second straight to open the season. Lossano went 4 for 4, scored two runs, and had two RBI. Tarrantino went 3 for 3, scored three times, and drove in a run. At Maplewood, the Chiefs and Bulldogs hooked up in good one with Reading coming out on top 8-7 in nine innings. Hank Oringer, who had a 3 for 5 night, scored the game winner in the top of the ninth after reaching on a single. Mike Andre (2 hits) tied the game up for the Chiefs in the bottom of the 7th with an RBI single and Mike Burgoyne did the same with a ground rule double in the 8th. Jordan Roper and Mike Taylor each had two hits for the Bulldogs. Nate Witkowski hit a solo homer for the Chiefs. Jack Burke picked up the win in relief and Sam Kasten struck eight for the Chiefs in five innings out of the bullpen. In Lexington, Tom Russo had three hits and three RBI to lead the Blue Sox to an 8-0 win over the Melrose Ameriacns. Veteran Ross Curley (3 runs scored, 2 hits), Josh Hasell (2 hits, 2 RBI), and John Puttress (2 hits ), paced the offense. Ryan Filipowicz pitched four innings in relief to earn his first win. He gave up one hit and struck out six. Dillon Corliss started for Melrose and pitched three innings, taking the loss. Mike Addesa, Nick Herzog and Tom Petry had the Americans hits. There are two games on the ICL schedule on Thursday. The Merchants travel to Victory Field in Watertown at 7:45 PM to meet the Reds and the Blue Sox entertain the Chiefs in Lexington at 8:00 PM. Joe Barry had two hits, including a double, and added three RBI’s to lead the Merchants to a 10-0 win over the Somerville Royals last Wednesday night as the 2016 ICL season kicked off at Walsh Field in Wakefield. Patrick McKenna and Scott Searles added a couple of hits each for the Merchants. Joe Westeman allowed just three hits and struck out four in his five innings to get the win. Steve Keskinidis and John Russolillo tossed a shutout inning each. Wyatt Stanley and James McConville had two hits each for the Royals. On Friday, Aric Dama went six innings to get the win and Lamare Rey chalked up the save when the Watertown Reds edged the Trojans 2-1 in Arlington. Dama struck out six batters and scattered four hits. Kyle LaVigne, Will Brennan & Steve Tramontozzi (RBI) had the hits for the Reds. Framingham State righty Zack Kirby made his first ICL start an impressive one, striking out a dozen and giving up just four hits, when the visiting Melrose Americans beat the Reading Bulldogs 4-1. Dan Cacciola (RBI), Isaiah Berg, Harrison Engstrom, Zeke Berg and Nick Herzog had the Melrose hits. Both of Sunday’s games were rained out. Aidan Freeburg tossed a complete game four-hitter, striking out six, when the defending champion Blue Sox opened up their season and knocked off the Watertown Reds in Lexington 5-2. Julian Alvarez and Alex Voitik supplied most of the offense each hitting a two run homer. Jonathan Bishop (0-1) took the loss for the Reds. At Maplewood, Jared Freni struck out ten and allowed just three hits in five innings as the Chiefs blanked the Somerville Royals 5-0. Veterans Tim Dunphy and Mike DiCato each threw a scoreless inning to keep the shutout intact. Tony Serino had two hits and a couple of RBI’s and Mike Barbati (2 RBI) and Danny DiMare each added a triple for the Chiefs. There are no ICL games scheduled for Tuesday.